Case Study: Successful "No-Bid" Part | KLH Industries Inc.
"Please review the attached drawing," read one e-mail to KLH Industries, Inc., "it is a complicated little part...many people have no-bid this part." Due to the lack of interest in the part (seen finished above), the mechanical engineer who sent the e-mail was even willing to alter his design and material specifications - just to receive a quote. While other manufacturers refused to bid on this part, a KLH Project Engineer responded to the engineer within 24 hours. After receiving the customer's 3-D model, the KLH Project Engineer knew why other shops were reluctant to bid. The part, which is roughly the size and shape of a golf ball split in half, required an 0.008" X-shaped center-slot with a 30° side taper through a thin wall. Once all the operations are done and the clamps are off, the stresses in the material would likely throw the part out of tolerance. "I imagine most shops would wire EDM cut the "X" shape of the part," said the KLH CSE, "but once all operations are done and the clamps are off, the stresses in the material would likely throw the part out of tolerance." In addition to critical tolerances, the customer also requested material certifications, a full-inspection report, and a matte finish on the underside of the part. Matte finishes on alloys are typically achieved by sandblasting, but in this case, protecting the razor sharp edges of the through slot would be next to impossible. Even with a shielding mask, sandblasting would still induce stress into the part. 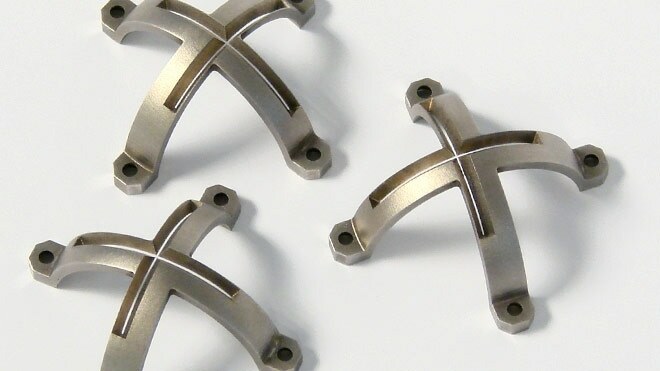 To make and finish this part within tolerances, less-stressful and less-conventional manufacturing methods were needed. In order to meet tight tolerances on such a small, delicate part, KLH's strategy was to manufacture the part in a free, unclamped state for all finish machining. The parts were roughed in from raw material using conventional CNC milling. From there, the parts were cut free from the roughed blank to allow stress-release. Both the inside and outside shape of the part was machined within .030" via sinker EDM. An aluminum fixture held the part in place, but did not restrict movement, which allowed stresses in the material to release naturally. Using a series of fixtures, the matte finish, outer shape, and slots were completed using sinker (or conventional) EDM. By carefully merging innovation with experience, KLH was able to manufacture a "complicated little part" at approximately 50% of the cost of the next closest bidder (according to the buyer).